I've said it before and I'll say it again, my favorite aspect of this blog is when I get to discover these little hidden gems, the diamonds in the rough that I might never have discovered otherwise. This is who I feel about Shallow Grave and their new record Threshold Between Worlds. This is the sort of emotionally powerful doom that drew me to the genre. Perfectly balancing the more twisted aspects of this music with its artsier side, Shallow Grave act as a sort of pivot point, showing a deep understanding of the work of Eyehategod, but also without sparing their love for Neurosis. What gets me about this album every time I listen to it is the use of dynamics There are some really powerful sonic choices here, choices made extremely obvious on tracks like Master of Cruelty. The band isn't afraid to put their foot on the breaks every now and then and focus on the incredible power of suddenly halting momentum. It serves to make the drive that defines the rest of the record all the more exciting. Threshold Between Worlds is an album that constantly conveys impressive breadth. The looming soundscapes communicate the sheer power this music can have, and it creates a sound you long to get lost in. Brooding and majestic, at its best Threshold Between Worlds is the sound of mountains moving. While the band still needs to evolve past some of the more limiting tropes of the genre, this is a really exciting release that shows a band with a ton of potential and a unique vision that doesn't stray completely off the reservation. 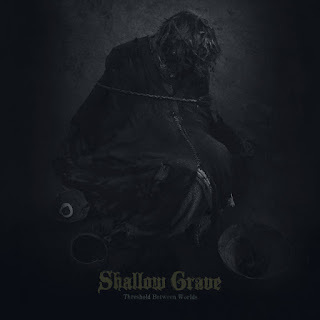 Shallow Grave are yet another stellar release by Sludgelord Records and I'm very curious to see how they evolve. As for now, Threshold Between Worlds is definitely going to be turning heads in the doom community.